From Patsy Walker #54 in the early 1950s comes (I kid you not) your very own ANTI-NAIL BITING KIT!!! 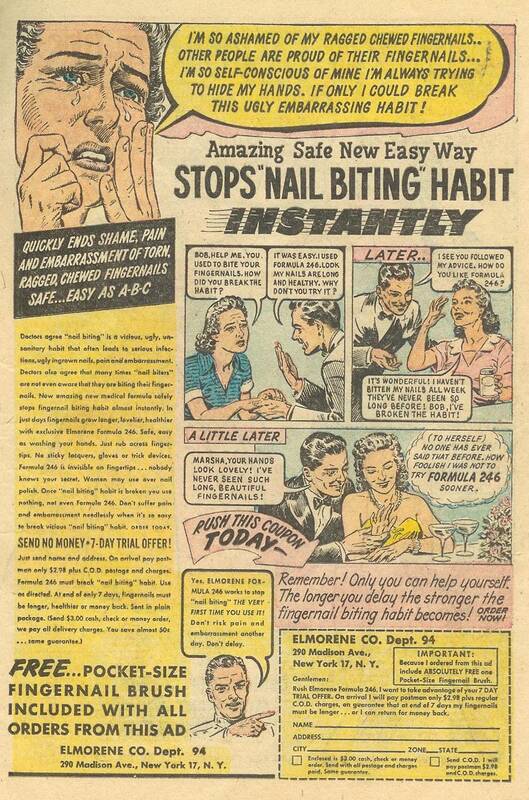 Honestly, was nail biting such an epidemic in the 1950s that the manufacturers thought they could make a profit advertising directly to the public? How common, exactly, was nail biting? Notice the directions to stop? “Just rub across the fingertips”. You know, just about anything could make you stop chewing your nails if you rub it across your nails. Ear wax medicine, toe jam cream, fast food secret sauce. I guarantee if you dab a bit of WD-40 on your digits that you’ll think twice about biting them. Formula 246 – sounds like some kind of car motor additive, doesn’t it? I wonder if I got some comics in the same era, if I’d find a similar formula for my “old reliable”? Bob’s got a bit of the Ronald Reagan look going, and the same senility. Marsha’s also a ditz. Bob could say whatever he wants, it doesn’t matter, since he ALREADY KNOWS her secret. He’s just flattering her to get… dang, this is like watching a really bad soap opera.